Ho Chi Minh City is chaotic and energetic, which makes it all the more important to find a place to stay that is the right fit for you. 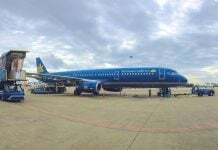 Have you finally booked your flight to Ho Chi Minh City but still need a place to stay? Then don’t fret! Below, we’ve curated a list of our favorite upscale, midrange, and budget hotels for you to choose from. Whether you’re here to spend a few days in luxury or want a place that goes easy on your wallet, we’ve got you covered. Looking to spoil yourself during your stay in Saigon? We’ve got just the place in mind for you! 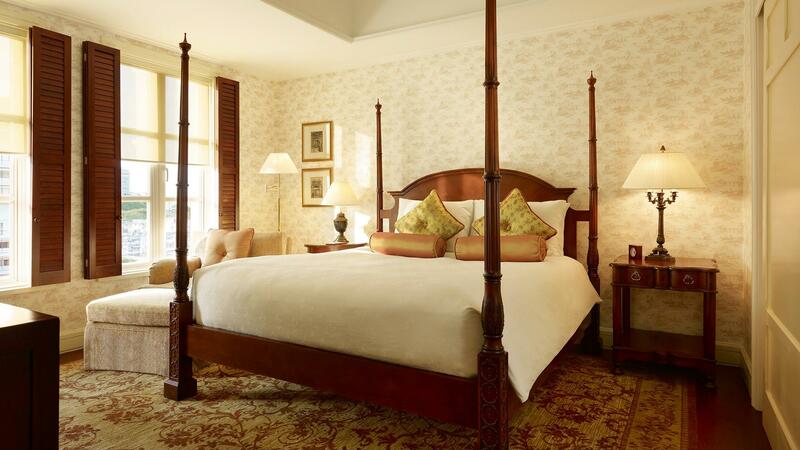 Set right in the heart of the town, the Park Hyatt is one of the city’s most luxurious hotels. Its elegant lobby, beautiful rooms, and friendly staff will make your time here so relaxing, you might not want to leave in the end. Just a few steps from the hotel you’ll find some of the city’s main sights like the opera house, Nguyen Hue walking street and countless restaurants and bars to choose from. Of course, the hotel itself also has some great venues to offer, such as the lobby lounge which serves high tea in the afternoon, or the bar with its generous happy hour promotions. If you’re lucky, you might even witness the visit of a celebrity mixologist who is ready to serve his signature drink to a hip crowd. Room rates start at around 350 US dollars for the night. Just a few steps from the river and close to all the most happening locations downtown, you’ll find the Myst Dong Khoi, one of Ho Chi Minh City’s coolest designed hotels. The outside of the building is covered in greenery, a theme which is reflected all throughout the property. Step inside the lobby and let the friendly staff welcome you to one of the coziest five-star hotels you’ve ever been in. 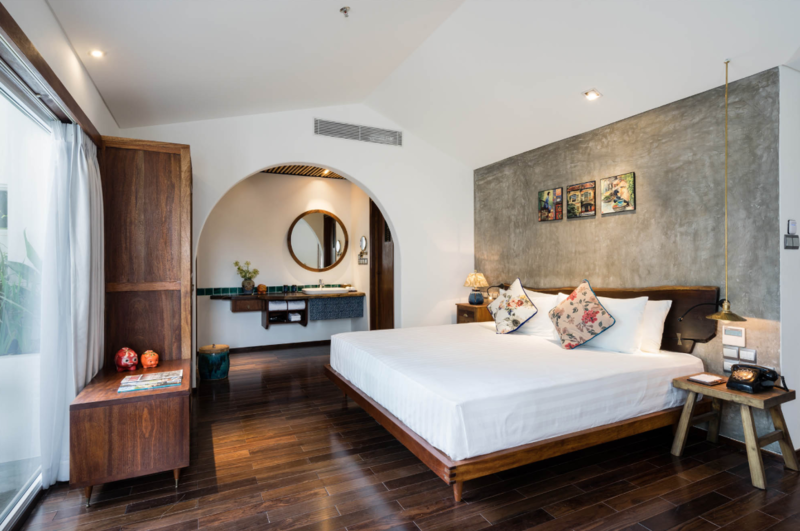 The rooms are spacious and while they are wonderfully elegant, the gentle arches and comfortable Vietnamese-style furniture make you feel more like you are visiting someone’s home rather than staying at a hotel. What’s coolest about this place though, is that many rooms have outdoor bathrooms, shielded from curious eyes with yet more lush greenery. Want to feel close to nature in the big city? This spot is for you! Room rates at the Myst start at around 200 USD. Where District 1 melts into District 3, the Hotel Des Arts Saigon M Gallery welcomes guests with a wonderfully elegant yet relaxed atmosphere. Only a short walk from the War Remnants Museum, the Independence Palace and many restaurants and bars, this hotel is the perfect place to stay if you want to combine visiting the city’s great sights with some nightlife and foodie-friendly activities. But even if you’re too lazy to walk one day, you won’t get bored at the M Gallery. Enjoy a sundowner or a dip in their rooftop pool all while taking in the sweeping views of the cityscape. For a great sunset view of Bitexco, this is the place to be. Room rates start at around 210 USD. Don’t need so much luxury during your stay in Saigon? Then here are some great hotels and Airbnbs that won’t break the bank but still come with all the comfort and amenities you need. If you want all the comforts of a proper apartment while traveling, Christina’s has got you covered. 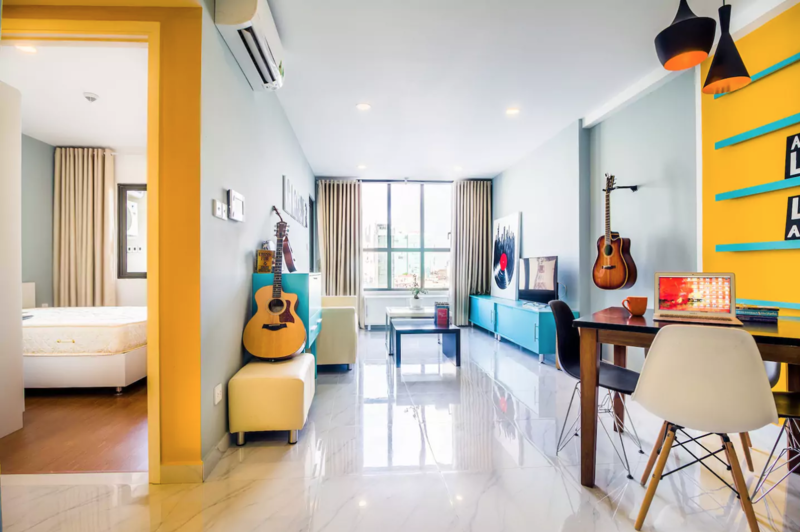 We’ve created a network of beautifully designed, fully furnished flats all around downtown Saigon, both in traditional buildings and modern condo towers. Whether you’d like a cozy studio just for yourself or you’re traveling with friends or family and need an extra bedroom or two, we’ve got it all. All units come with the necessary amenities, even kitchenettes, and common spaces. You’ll find yourself feeling at home in no time. Not just a space to sleep but a place to live! Browse through our website to find the place that best matches your needs in terms of size, location, and amenities. We’re sure you’ll find exactly what you need. 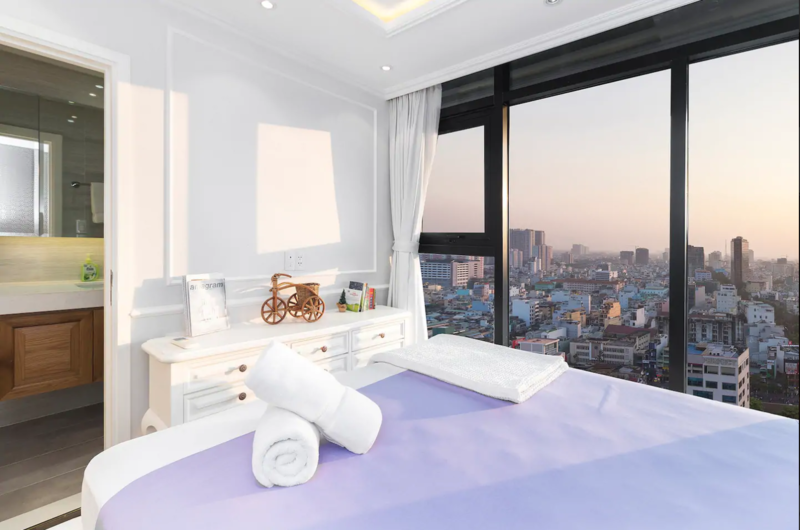 And on top of providing you a great place to stay in Ho Chi Minh City, we also have an awesome team who can recommend all kinds of fun off-the-beaten-path activities and places to visit while you’re here. Room rates start at 35 USD. Address: in all the best places in Saigon! 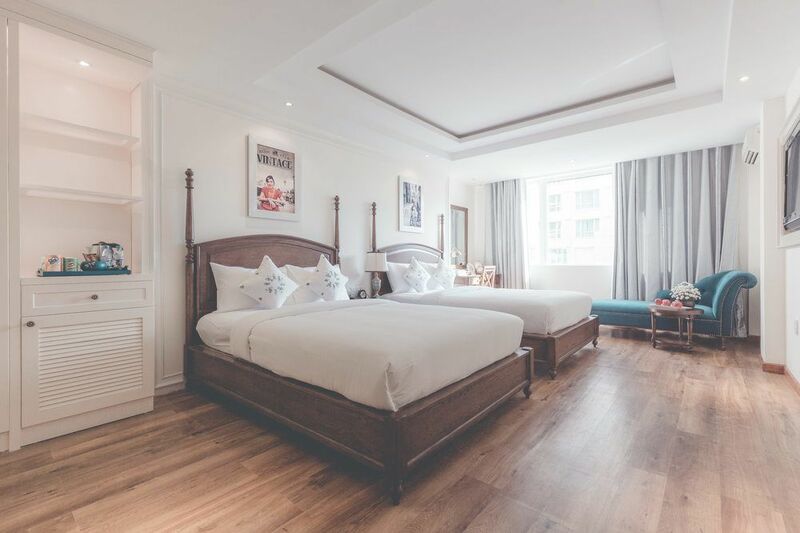 An upscale hotel with a great price tag, the Pullman Saigon Center is the hotel for you if you like to add a little luxury to your trip but don’t want to pay through the nose for it. 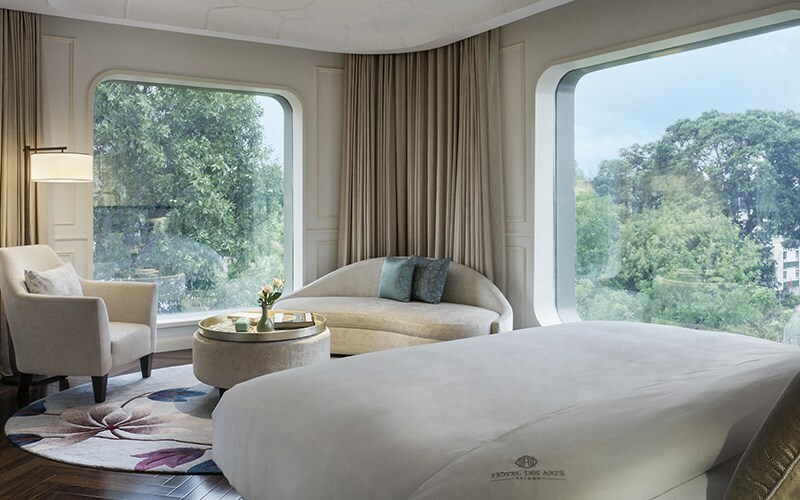 With its modern design, spacious rooms and great views, the Pullman is perfect to kick back and enjoy rooftop vistas of the city after a long day of sightseeing or eating your way through Saigon’s many yummy restaurants. Just a quick taxi ride from the main attractions and set in a cool part of town with plenty of bars, restaurants and shops, the Pullman offers excellent service whether you’re in town on business, with a family or a group of friends. Room rates at the Pullman start at around 110 USD. Just a stone’s throw from the famous Ben Thanh market, the Alagon Zen Hotel & Spa is ideal for you if want to stay in the center of the city and enjoy those little bits of luxury which make life so much more fun. Head out in the morning to shop your heart out at Saigon’s most famous market, stop by some of the countless little boutiques you see on the way, make your way over to the Independence Palace and War Remnants Museum, and end the day with a relaxing drink at Alagon’s rooftop pool. Sound like a good day? If you’re not done yet, hit up some of the cool bars in the area or try some of the city’s best street food around the hotel. You won’t be disappointed! Room rates start at around 70 USD. 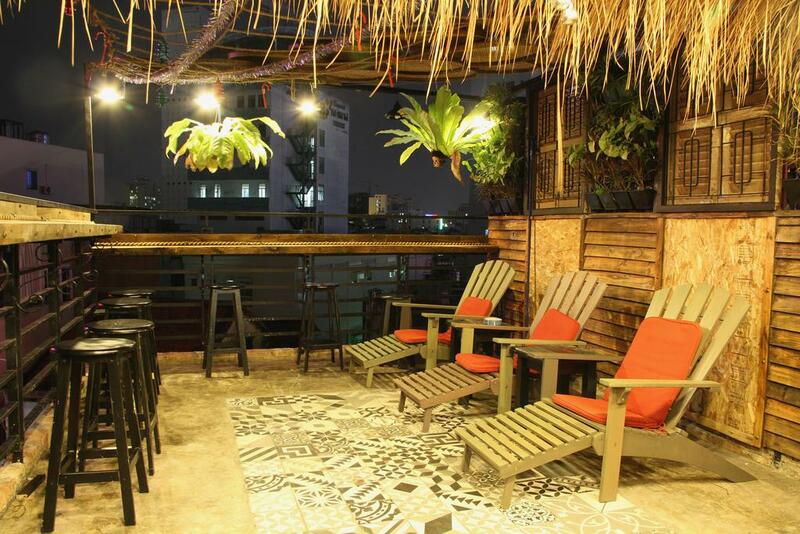 A list of Ho Chi Minh City’s best hotels would be incomplete without some super budget-friendly hostels. If you’re planning on saving your money for cool activities, restaurants and bars, here are some places you could stay. One of the coolest places to stay if it’s your first time in Saigon and you’re backpacking around the country is Bui Vien. This little street in District 1 is the place where you’ll find some of the city’s cheapest hostels, most fun bars, and many tour operators who can help you organize the next steps of your trip. It should come as no surprise that most backpackers stop here for at least one night. Book a bed here to escape the noise but stay close to the action. 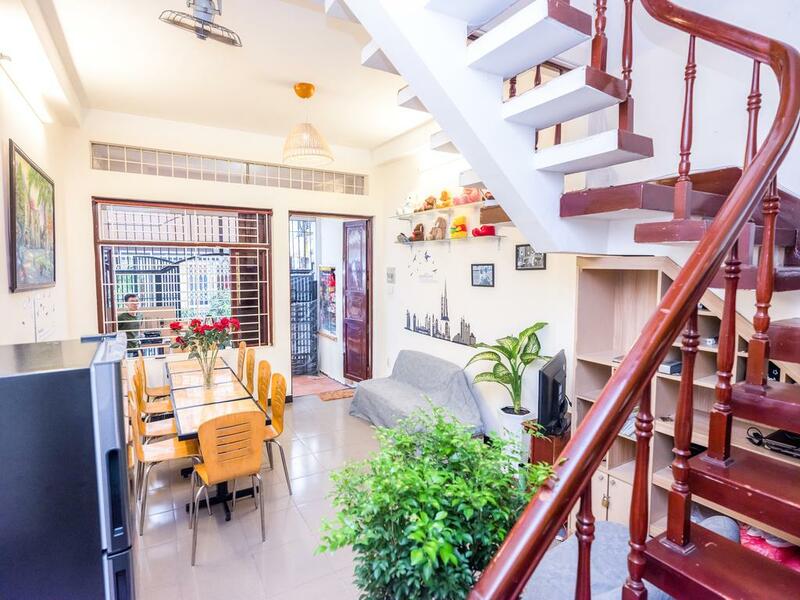 The Happy Saigon Hostel is set in a little side street off busy Bui Vien and is perfect for you to relax after a long day of exploring all while staying close to the happening neighborhood. They offer quite a variety of rooms, so be sure to book the right one. You can choose between a bed in a mixed or male-only/female-only dorm or go for smaller rooms with only two to four beds. Those are ideal if you’re traveling with some friends and want to stay in the same place, or even with a family. There’s also some good food to be had here, so you can get a yummy breakfast banh mi (Vietnamese sandwich) or some other simple dishes to start off your day on the right foot. Dorm beds start at 6.50 USD. With a huge selection of hostels to choose from, it’s not easy to know which one to go for and which ones to avoid. The Vintage Hostel is definitely worth a try. 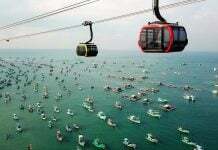 It’s quite new, very clean, and has friendly staff who are happy to help find your bearings in a new city. You can choose from mixed dorms or male/female dorms, or even go for their twin rooms if you want more privacy. The hostel also offers a kitchen and a bar where you can meet others staying here or browse through the many travel guidebooks while having a drink. Dorm beds start at 9 USD. Set close to Bui Vien (the backpacker street), Mobylette Saigon Hotel is a cool place to stay if you appreciate funky design. It’s newly set up and decorated in a fun industrial style and the rooms are large and clean. 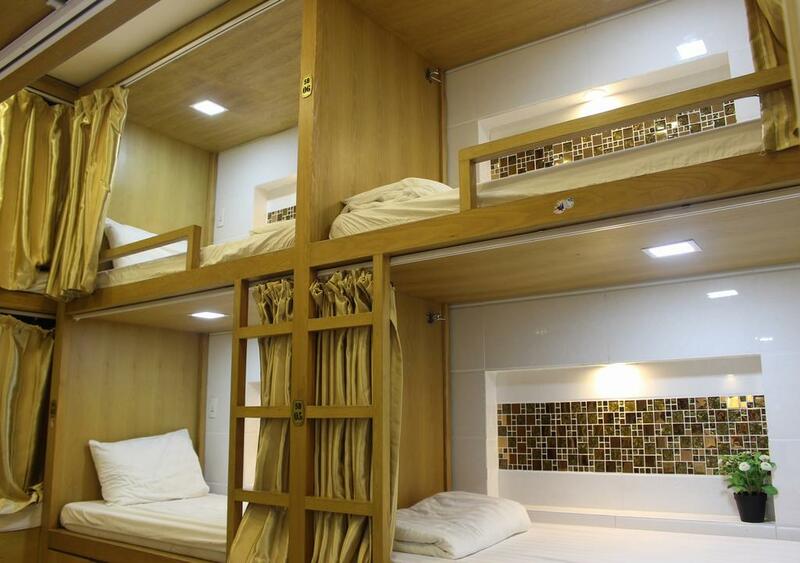 You can opt for a spot in a dorm of up to ten beds or choose a private room with twin or double beds. What most guests love about this place, apart from the funky look, is that the food here is so good. Order a freshly made omelet for breakfast or get a bowl of steaming hot pho if you want to start your day like a local. 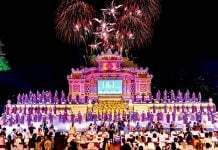 Either way, you’ll have plenty of energy to explore the city, see the sights and get a taste of Saigon’s nightlife. Dorm beds start at 10 USD. 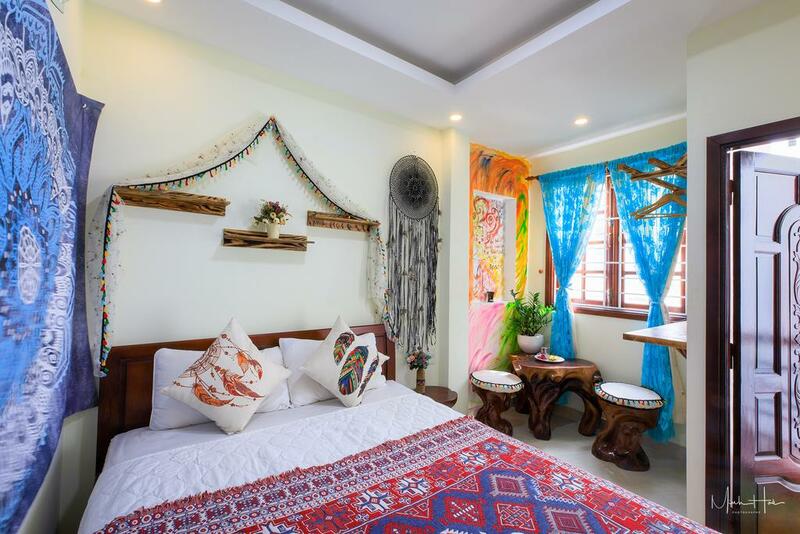 While it’s a bit pricier than other hostels, Boholand Hostel is well worth it, especially if you like mandalas and other boho style decoration. Here, you can choose between double rooms with or without private bathrooms, so you have more privacy than in hostels with huge dorms. To get to know other guests, join everyone on the rooftop for a delicious breakfast of fried rice, pho, or omelets. Since Boholand is only a few minutes’ walk from all the major sights and attractions, you’ll find it easy to get around. Plenty of bars, restaurants and clubs are also close by, so if you want to end your day with a long night out, this hostel is the perfect place to stay. Double rooms start at around 20 USD. With so many hotels and hostels to choose from in Ho Chi Minh City, it can be hard to pick the right one. 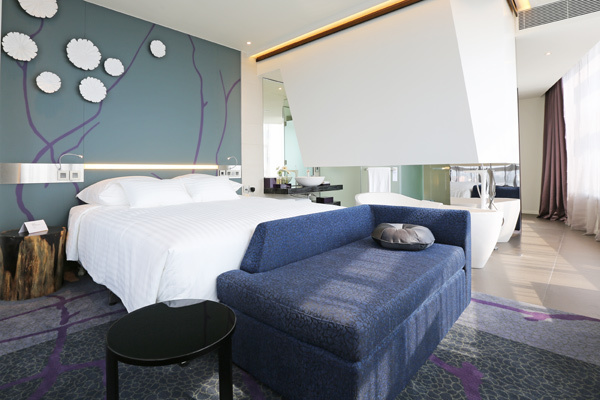 We hope our list of the top ten places to stay in Saigon helped you out. Which one did you go for? Let us know in the comments which was your favorite place or if we need to add another one to this post!